Groups of middle school students were likely spotted on campus March 6 and March 20 for the Patriot League music festival. Newman University hosted the event as a way to showcase the university to students and families. Deanne Zogleman, B.M.E., instructor of music and director of choral music, ran the event. “It is the perfect way to showcase our university and our beautiful facilities. These music festivals are often held on college campuses, but we hadn’t done one here,” she said. In order to accommodate the number of groups, the event took place on two different days. 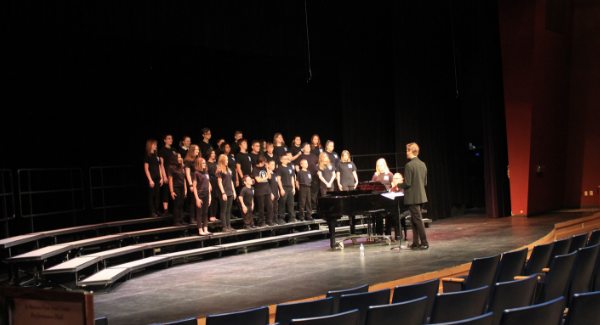 The west division choirs attended March 6 and the east division on March 20. The festival included large choirs, ensembles and solo performances from 11 different schools. Judges scored each performance to determine a rating. In addition, lunch was provided for attendees. With the help of senior Taylore Entz, the leadership team and volunteers, Zogleman said this was a successful event. 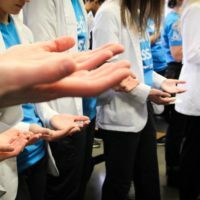 The festival brought 927 participants, their teachers and family members to campus, providing a way to promote Newman University to the large population. Zogleman commented that this event was “just an all-around great way to show off Newman to music instructors, our adjudicators that came in and students and their parents who came to watch throughout the day. “We have had an excellent, positive response from the activities directors from each school in the Patriot League,” Zogleman added. The visiting students also completed surveys regarding their thoughts on the event, which reflected positive feedback on the campus and the event organization. Zogleman said she was pleased with the success of the event and the positive response from the participants. She also expressed there is interest in hosting this festival annually as a way to enrich the Newman music department and promote the university.